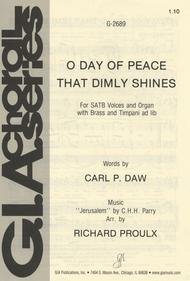 O Day of Peace That Dimly Shines composed by Richard Proulx, C.H. Parry & Carl Daw Jr.. For SATB choir, assembly, organ accompaniment. Advent. Sacred. Easy. Octavo. Text language: English. 4 pages. Published by GIA Publications (GI.G-2689).With Text language: English. Sacred.Tune Name: Jerusalem.